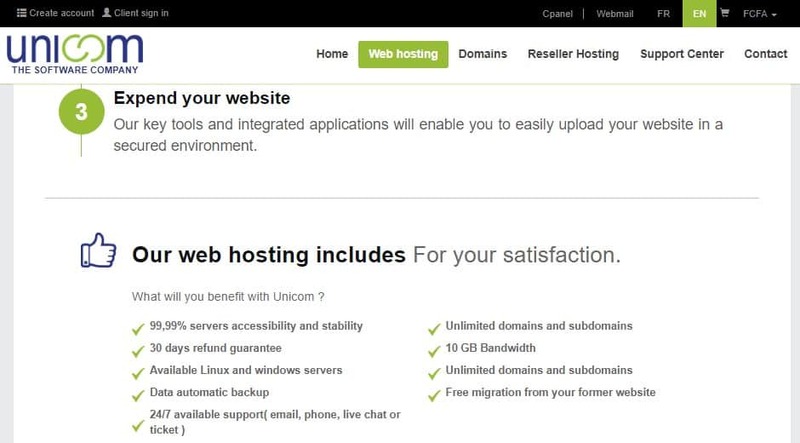 UNICOM Review 2019: Is UNICOM a Good Hosting? UNICOM is a Cameroon-based web hosting company that began its operations in 2010. The vendor specializes in offering shared web hosting, reseller hosting, and CMS hosting solutions to small and medium-sized businesses in Cameroon and beyond. UNICOM is a web hosting company based in Yaoundé, Cameroon. The hosting provider offers shared web hosting and reseller hosting solutions to both local and international enterprises. The UNICOM website is available in both English and French. UNICOM’s shared hosting packages include Virtuoz, the vendor’s starter package that comes with 5GB of disk space, 10GB bandwidth, two hosted domains, 50 email accounts, and five MySQL databases. Business Pro, the vendor’s premium shared hosting package, includes the following features: 250GB disk space, 500GB bandwidth, unlimited hosted domains, unlimited email accounts, and unlimited MySQL databases. UNICOM offers their clients automatic daily backups, allowing them to restore their website with ease following a disaster. It also boasts a 99.9% uptime through its rock-solid network. UNICOM has a number of hosting packages and an easy upgrading process so that users can keep upgrading their plans as their business needs grow. The UNICOM hosting platform supports multiple operating systems. What’s more, it’s designed to work well with Joomla, WordPress, and other content management systems. UNICOM includes Softaculous to make it easy to install these and other scripts in a one-click process. The feature also streamlines the process of updating as well as maintaining the more than 100 open source applications included in each of their hosting packages. The UNICOM website is well-organized, however, some of the internal links are invalid or unresponsive, making it somewhat hard to navigate. What’s more, they seem to have some issues with the SSL certificate. Before visiting the website, most browsers warn the user to be aware that the website might be unsafe to surf. In addition, several times when I have attempted to clarify information on the website, I found it to be completely inaccessible. UNICOM hosting plans are quite cheap, though the billing cycles are a bit inflexible; webmasters can only pay for their subscriptions once a year, once every three years, or once every five years. Users looking for shorter monthly contracts will have to look elsewhere. The prices of UNICOM hosting plans are listed on their website in Central African CFA franc and U.S. dollars. They offer free website migrations from a user’s former hosting company, a free domain name and a 30-day money-back guarantee. Webmasters who wish to contact UNICOM can do so via email, live chat, or ticketing system, though they have not made available a support phone number. Though the vendor claims that its support team is available 24/7, my experience suggests otherwise. The vendor did not respond to my queries on all of the communication channels it has made available. Like many other links on this hosting provider’s website, the knowledge base link is unresponsive. UNICOM’s cheap hosting solutions and array of features endear the vendor to small and medium-sized businesses in Cameroon. However, the vendor’s website seems to have a notable number of unresponsive links that make it difficult for potential customers to get a clear picture of the hosting solutions on offer. Wondering how UNICOM stacks up against other Web Hosting companies? Enter any other Web Hosting company and we will give you a side-by-side comparison.